HONG KONG, May 29, 2011 (AFP) - Hong Kong officials said Sunday they will consider banning imports from Taiwan, prompted by a food scare after the neighbour ordered a recall of nearly half a million contaminated drinks. More than 460,000 bottles of sports drinks and fruit juice, as well as 20 tonnes of fruit and yogurt powder and 130,000 packs of probiotic powder were recalled earlier this week over fears they contained a chemical used in plastics. 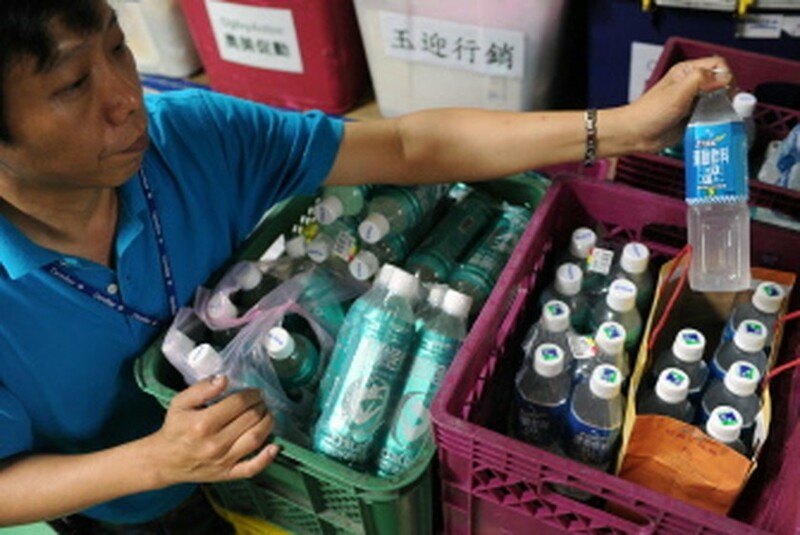 AFP - A worker displays a sports drinks containing a platicizer called DEHP after removing at a supermarket in Hsintien, New Taipei City, on May 26, 2011. "If necessary, we can use our existing regulations to ban imports to ensure that those products would not be sold in the market," York Chow, Hong Kong's secretary for food and health said in a statement. "According to the information given by the Taiwan authority, the incident seems to be quite widespread in many aspects of food ingredients, involving not only drinks, but also drugs," he added. Chow added that most of the contaminated products are currently not sold in the city. Taiwan removed the products from shelves after health officials found locally manufactured drinks containing a plasticiser called DEHP, which could affect the hormone balance in young people. Authorities on Monday arrested the owner of a Taiwanese company which had used the DEHP rather than palm oil, which is five times more expensive, in products supplied to dozens of local drinks makers.